How to beat your very first Prestige Nightfall in Destiny 2. Aside from the Leviathan Raid and Trials of the Nine, the Prestige Nightfall is the most challenging activity in Destiny 2, requiring communication, timing, and a high Power level. Completing the Prestige Nightfall will reward you with a special Aura, as well as an Achievement or Trophy for your first success, so it’s well worth the effort. At low Power, the Prestige Nightfall will be an extremely close and challenging fight. Before you even launch the Prestige Nightfall, you will want to ensure you have a decent team setup. Due to the rotating elemental damage caused by Prism, it’s important that all element types are covered evenly by the team. One player should have Void and Arc, the next should have Arc and Solar, and the last should have Solar and Void weapons. This three-way split ensures two players can deal maximum damage during each element phase. 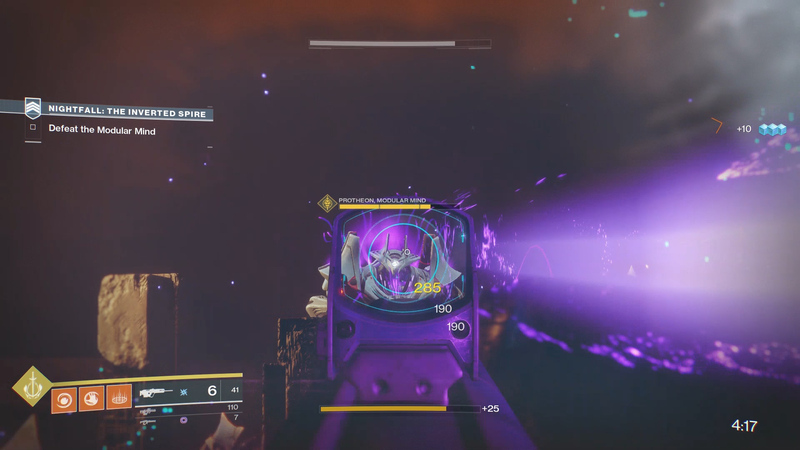 For The Inverted Spire Prestige, clear out the enemies before activating the Timewarp Rings. This allows you to ensure absolute safety while collecting the time buffs, which add 30 seconds to the timer. The rings do not appear until you jump through the first one, so leaving it alone until everything is dead is an excellent idea. Passing through a ring adds 30 seconds to the timer. 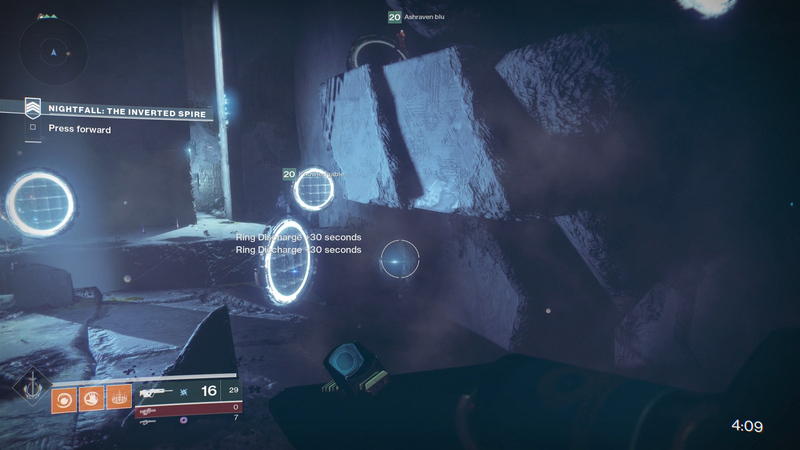 There are only three instances where you can pass through the rings: in the first cave where you fight the Vex, out in the open battlefield before crossing to the drill, and in the drilling site where the drill arms spin around. At the start, send your most powerful player across the waterfall early while the other two begin the mission, this saves precious seconds. 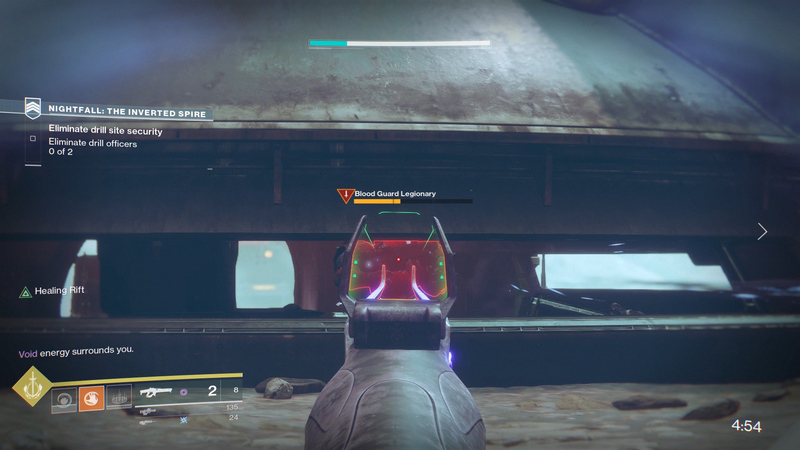 When you begin the Nightfall, you can send one person to the right and have them bypass the beginning phase. 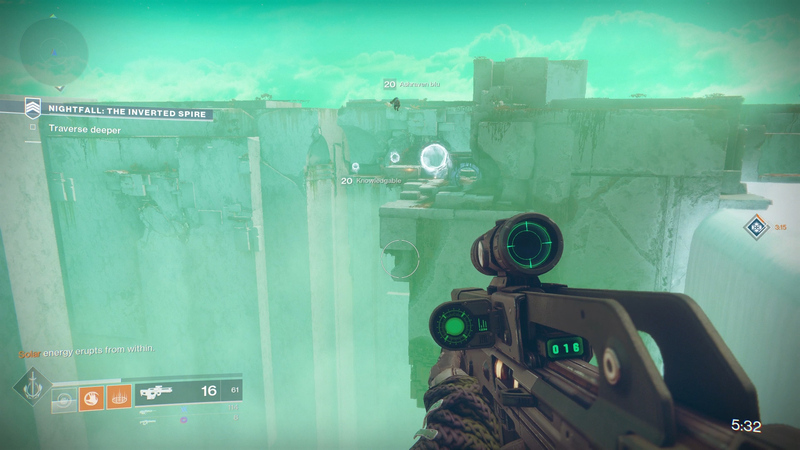 They can use their Sparrow to fly over the cliff and use the Vex cannons to launch into the next area while the other two clear out the starting location and summon Ghost to create the path. This allows two areas to be cleared at once. In the cavern with the first rings, leave one person up the top, send one person to the right platform, and one person down low. Clear out the enemies and then everyone can collect the rings as fast as possible. Attack the Cabal from outside the bunkers. For the main battlefield, huge the sides and attack the Cabal Majors through the gaps, being sure to use elemental weapons for high damage. Once cleared, take down the large Cabal in the center and then begin the process of collecting the rings. Jump across to the drill, clear the enemies, drop down and activate the terminal, and then you can die and respawn. Respawning allows you to stay up the top while the hacking percentage increases. Jump down and into the cannon as soon as its completed. For the drilling section, it’s mostly luck and timing. Try to clear a few of the enemies around the ledges, but ultimately you may just need to jump through the ring and begin the collecting. For the first phase of the boss fight, you will want to use your elemental weapons to burn the boss down, saving your Supers for the final engagement as it’s unlikely you’ll get enough Orbs of Light or kill enough enemies to fully recharge your Super. Be careful of the Void damage cycle, as the Harpies will decimate your health with ease. 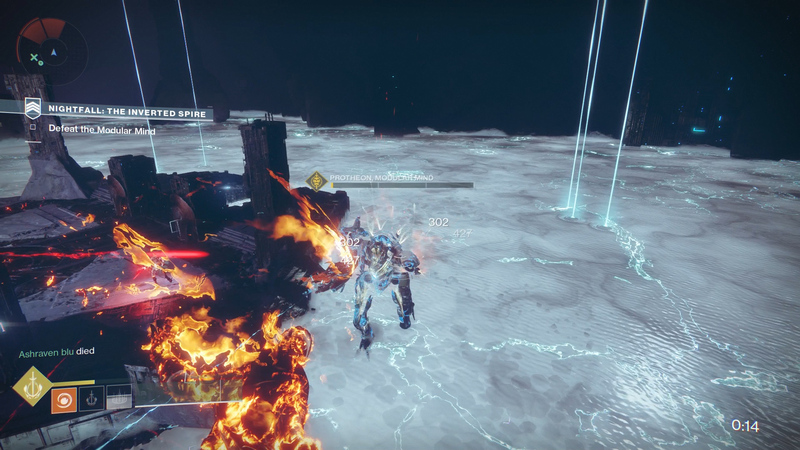 Save your Supers for the end phase to quickly burn him down. On the second platform, be aware of when he slams to create lava, as you will need to jump to avoid this damage. Stick to the outside and burn him down with your weapons and grenades. In the final stage, wait until the appropriate damage cycle begins before activating your Super to maximize your damage output. Take a moment to clear adds between Supers, and if you can, try to generate Orbs of Light for your allies, as any additional Supers will help defeat the boss. If you manage to hit all these points just right, you should be able to complete the Prestige Nightfall. Waiting for the following week for Luminous Engrams to increase your Power level can be a good idea if you’re struggling to finish. The closer to Power 300 you are, the easier it will be to complete the Prestige Nightfall in Destiny 2! Be sure to check out our Destiny 2 hub for more guides.